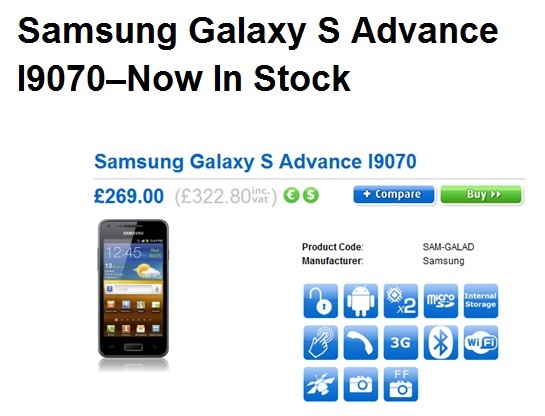 Samsung Galaxy S I9070 Advance is now in stock at various retailers across Europe. The smartphone was announced back in January and it was scheduled for April release. As the model number suggests, Samsung Galaxy S Advance is placed between Galaxy S and Galaxy S II. The Galaxy S Advance comes with a 1GHz dual-core Cortex-A9 processor, Mali-400 MP graphics, 768MB RAM and first-generation Super AMOLED WVGA screen. There is a 5 megapixel camera with HD video recording and 8/16GB internal storage as well as optional NFC connectivity. The phone runs on Android 2.3.6 Gingerbread, but it will probably get ICS later this year, no official word yet. You can buy this nice Android guy from Clove UK just spending £323($520). Amazon DE offers the non-NFC version of the Galaxy S Advance for €365($480).